There are probably others, but Master Planner Spencer knows that information is power so he never tells me anything. I get this tape recording that self destructs on the way to the airport…. I hope to see you at a con! Comic Book Storytelling – Former Marvel Editor in Chief Jim Shooter explains the principles of visual storytelling. Using a slide presentation of Jack Kirby’s work on Captain America, Jim walks you through the cinematography of the graphic story and shows you how to make compelling images that deliver your story with power and precision. Essential knowledge for writers as well as artists. 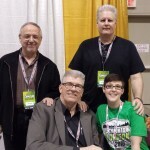 Comic Book Writing – Former Marvel Editor in Chief Jim Shooter tells you what you need to know to create and write comics stories. Using slides and examples, Jim explains how to get an idea, the art and architecture of stories, how to write well and successfully, and more—revealing fundamentals of the craft that will help you bring your creations to life. Essential knowledge for artists as well as writers. I will probably be doing one or both plus the Inking and Coloring Rants at subsequent cons. Check your local listings. Looking forward to meeting you at Florida Supercon. I was wondering if you had a limit on signing books and/or do you charge for signatures? Looking Forward to meeting you at Florida Supercon. I was wondering if you have a limit on books to get signed and do you charge for signatures? Hi Jim. I’ve been waiting quite a while for the legion to be reintroduced into the D.C. Universe I can only guess that the absence of the legion is due to an absence of talent needed to bring the legion back to life. Would you have any interest in bringing the legion back to life ? Are you going to be at the wizard con in Austin this year? I would love to see you the the Grand Rapids Comic Con. Do you plan to do any UK con appearances anytime soon? Hi Mr. Shooter , do you think you will ever go to Charlotte and do “Heroes Con” ? I know Stan Lee has done it and was there last year. Jim Steranko will be there this year.